Respiratory disease is the most common cause of sickness and mortality in the feedlot. The selection of an appropriate antibiotic and the evaluation of its success in the treatment of respiratory disease is an important consideration to the feedlot owner and his veterinarian. The aim of this study was to investigate penicillin (5 million IU) in treatment of pneumonia in calves. In this study, forty crossover calves of 3-6 months of age with an average weight of 60 to 100 kg with pneumonia were clinically examined. Understudied calves were distributed in two groups, in control group for treatment penicillin (5 million, Nasr pharmaceutical drugs Co.) was used, and in the other group the penicillin (5 million Erfan pharmaceutical drugs Co.) was used. During the treatment phase of patients with pneumonia in control and experimental group, sterile swabs was taken from the lower part of the URT of infected patients, and simultaneous with antibiotic therapy, the taken sterile swabs were undergoes bacteriological examination and types of bacteria was characterized. 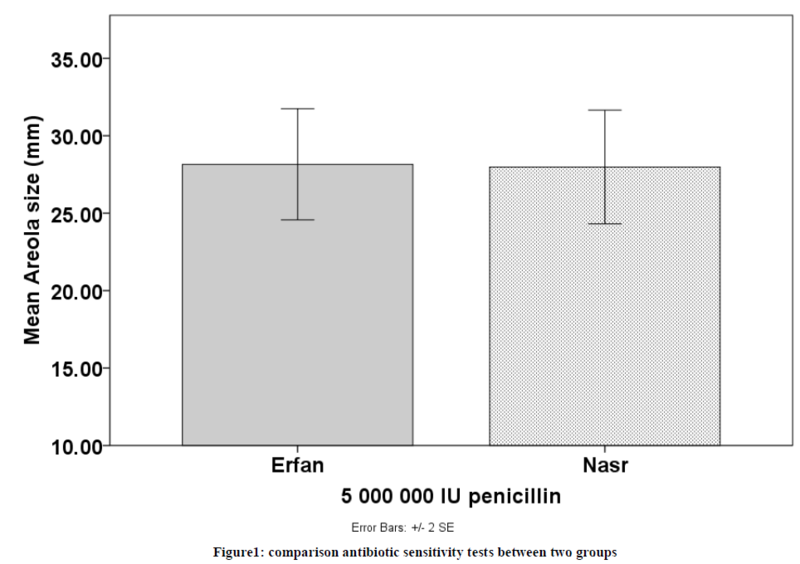 Statistical results indicated there is not any significant differences between two different penicillin in antibiotic susceptibility (p>0.05). Researchers constantly have been tried new producing drugs but have not achieved the desired product due to the wonders of life and biology and although these products are good in times. It seems that penicillin procaine injection powder (5 million IU) according to our study results may be effective in the treatment of pneumonia in calves with the effective range. Respiratory disease is the most common cause of sickness and mortality in the feedlot [6,13]. The selection of an appropriate antibiotic and the evaluation of its success in the treatment of respiratory disease is an important consideration to the feedlot owner and his veterinarian. Many antimicrobials have been used in the treatment of respiratory disease and have been evaluated to some extent . Initial field trials with a potentiated sulfonamide suggested a high level of efficacy in the treatment of bacterial diseases of cattle and pigs . In this study, we compared the efficacy of two different (5 million IU) penicillin in the treatment of calves respiratory disease. Penicillin had a significant bactericidal effects, especially affects on gram-positive but mostly it is ineffective on gram-negative bacteria. Some of the bacteria with the 0.07 units of penicillin per ml (ml) will stop growing, include Clostridium perferingens, Clostridium tetani, Staphylococcus aureus, Streptococcus agalactiae, and Corynebacterium pyogenes . Another group of bacteria, which the above amount of penicillin does not inhibit, the growth of them are Gram-negative bacilli and includes following: Escherichia coli, Salmonella, Klebsiella , the Proteus spp. and Pseudomonas spp., which are very resistant to it [2,3]. When penicillin is comparing with tetracycline or other broad-spectrum antibiotics, it should be consider the relatively narrow range of the spectrum but important antibacterial range of penicillin . Penicillin is usually ineffective in mammalian because the mammalian cells are without rigid cell walls specific for bacteria. Most penicillins which are in water suspended when injected intramuscular (IM) or subcutaneous (SC) have been absorbed into the body quickly and maximum densities in their blood are achieved within 15 to 30 minutes after injection . The most common route of penicillin injection is intramuscular injection . A study results indicated that when in horses 4400 to 8800 units per kg penicillin procaine in oil with aluminum monostearate are injected, a blood density of penicillin that there are more than 3% unit penicillin per ml blood’s of them and in horses’ blood for about 96 hours and in some of them longer stays . Although oil solvent will help produce higher blood levels, but due to its poor physical properties, vast consumption of it, is limited. In addition horses may show acute or chronic adverse tissue reactions for oil solvent in one prescribe of antibiotic. Procaine penicillin in neutralized aqueous sample (with reagents), that there were 500000 units per ml of the substance (penicillin) are available for intramuscular injection is useable. This type of penicillin solution has longer absorption than aqueous solution of it and the therapeutic density in plasma is about 24 hours, but an oil solution and aluminum monostearate have too long delayed absorption. This type of penicillin solution is useful than oil solution of it. Because the residual of oil is not remaining in the tissues. Procaine penicillin G, is composed of one molecule of procainamide and one molecule penicillin and there is a ratio of 15.5% procainamide and penicillin (the effective substance) of it is 940 units per mg . Thus, in each ml of solution (suspension) containing 500000 units of penicillin and 125 mg of procainamide . Bronchopneumonia with pathogens invade the lungs caused by breathing air way. In calves of dairy breeds often call this type of pneumonia enzootic pneumonia that for its outbreak in calves, management, infectious and environmental factors are involved [10,18]. Environmental and climate change, which will cause more disease outbreak in cold seasons, but it seems the management and infectious disease will have a prominent role in disease and the damages of that. For example, overcrowding, inadequate ventilation, exposure to adult cattle, or lack of nutritional factors has been reported . The aim of this study was to evaluation of 5 million units procaine penicillin injection in normal incidence of calves pneumonia. In this study, forty crossover calves of 3-6 months of age with an average weight of 60 to 100 kg with pneumonia were clinically examined. Pneumonia refers to the cases of loss of appetite, depression, increased respiratory rate to more than 50 per minutes, spontaneous cough or in handling of the trachea, and abnormal lung sounds and nasal catarrh. The infected calves were divided into two equal parts: A) The control group that for treatment of them we used penicillin 5 million units manufactured by Nasr pharmaceutical drug Co. by dose of 50000 IU/kg. It was used for deep intramuscular injection. B) The experimental group, for treatment of case in this group penicillin 5 million units manufactured by Erfan pharmaceutical drug Co. by dose of 50000 IU/kg was used for deep intramuscular injection. During the treatment phase of patients with pneumonia in control and experimental group, sterile swabs was taken from the lower part of the URT of infected patients, and simultaneous with antibiotic therapy, the taken sterile swabs were undergoes bacteriological examination and types of bacteria was characterized. The bacteria isolated in culture, undergoes antibiotic susceptibility tests by antibiotic discs which were made by control and experimental antibiotics, and thus the inhibition rate of bacteria growth was determined by the disks. About 4 days after treatment started, cases that were treated in both groups were investigated. The recovery criteria, was including improved respiratory disorders (sounds, discharge, clinical findings), gain complete appetite. Data analysis was performed using SPSS Statistical software (ver. 18). Bacteria isolated from nasal swabs of patients and antibiotic susceptibility test (areola size: mm) of control and experimental group has been shown in the following table. Statistical results indicated there is not any significant differences between two different penicillin in antibiotic susceptibility (p>0.05). Infectious agents, including two main groups, one is viruses and the other bacteria. Common viruses are: PI3, IBR and BRSV that in Iran IBR has been reported the most common viral agent. Other viruses may have a lower frequency involved in the pathogenesis . The most important bacteria that play a role in pneumonia include: Mannheimia haemolytica, Pasteurella multocida and Haemophilus somnus pneumonia, which presence of these bacteria in pneumonia lesions of slaughtered cattle around Tabriz and Tehran have also been reported [9,19]. These bacteria are normal residents of nasal and pharynx mocus, but these bacteria are not found in normal healthy lung and are known as opportunistic microorganism. In poor management and poor weather conditions or respiratory viral infections it will create opportunities for these bacteria . When bacterial agents were deployed in the lungs, alone or with viruses inflammation conditions were developed in lung and finally it cause bronchopneumonia with symptoms that lead to increased body temperature, increased respiratory movements, cough and nasal excretion that consistency of that will vary based on time. In treatments of animals infected with bronchopneumonia, three main goals are considered and include: 1) Removal of invasive bacteria, 2) limiting the inflammatory reaction, 3) Supportive therapy and good nursing. For remove or decrease invasive pathogenic bacteria, the use of antibiotics are inevitable [11,12]. Researchers constantly have been tried new producing drugs but have not achieved the desired product due to the wonders of life and biology and although these products are good in times. It seems that penicillin procaine injection powder (5 million IU) which is produced by Erfan pharmaceutical company according to our study results may be effective in the treatment of pneumonia in calves with the effective range. D. Acheampong, L. Boamponsem, P. Feglo, Advances in Applied Science Research, 2011, 2(4): 187-193. M. Akpan, C. Odeomena, C. Nwachukwu, B. Danladi, Asian journal of plant science and research, 2012, 2(3): 335-341. M. Alo, C. Anyim, J. Igwe, M. Elom, D. Uchenna, Advances in Applied Science Research, 2012, 3(2): 844-848. W. P. Brisbane, Can. Vet. J., 1963, 4(9): 234--235. L. A. Brunton, D. Duncan, N. G. Coldham, L. C. Snow, J. R. Jones, Vet Rec., 2012, 171(12): 296. Epub 2012 Aug 18. T. L. Church, O. M. Radostits, Can Vet J 1981, 2227-30. P. B. English, Austr. Vet. J., 1960, 36253-260. A. Franklin, Holmberg. O., M. Horn Af Rantzien, G. Astrom, Am. J. Vet. Res., 1984, 45(7): 1398-1402. A. Hazem, F. Al-Charchafchi, D. Ghazzawi, Der Pharmacia Sinica, 2012, 3(3): 349-356. C. A. Hjerpe, In: J. D. POWERS & T. E. POWERS, Ed., 10th Annual Food Animal Medicine Conference, 1984 Columbus, Ohio. 228-255. K. Jyothsna, S. Madhavi, M. V. Rama Rao, Der Pharmacia Sinica, 2011, 2(6): 143-148. S. Mann, J. D. Siler, D. Jordan, L. D. Warnick, Foodborne Pathog Dis., 2011, 8(8): 861-7. doi: 10.1089/fpd.2010.0751. Epub 2011 Mar 7. S. W. Martin, A. H. Meek, D. G. Davis, R. G. Thomson, J. A. Johnson, A. Lopez, L. Stephens, R. A. Curtis, J. F. Prescott, S. Rosendal, M. Savan, A. J. Zubaidy, M. R. Bolton, Can J Comp Med, 1980, 441-10. R. S. Mcconnico, M. C. Roberts, M. Tompkins, J Am Vet Med Assoc., 1992, 201(9): 1402-3. W. F. Rehm, G. A. White, Vet Rec., 1970, 8739-42. R. M. Richert, K. M. Cicconi, M. J. Gamroth, Y. H. Schukken, K. E. Stiglbauer, P. L. Ruegg, J Dairy Sci, 2013, 15(13): 00354-8. I. A. Schipper, D. Filipovs, H. Ebeltoft, L. J. Schermeister, J Am Vet Med Assoc., 1971, 158(4): 494-500. P. R. Scott, Ir Vet J., 2013, 66(1): 5. doi: 10.1186/2046-0481-66-5. M. E. Theurer, D. E. Anderson, B. J. White, M. D. Miesner, D. A. Mosier, J. F. Coetzee, J. Lakritz, D. E. Amrine, J Anim Sci, 2013, 88.